Matrox Orion HD, a high-performance graphics adapter with video capture capabilities, provides the ideal solution to the legacy standard definition (SD) and advanced high definition (HD) video needs found in many medical imaging, video surveillance and simulation/training applications. The Orion HD features two independent video input paths. Each video input path can connect and switch between RGB / CVBS (3) / YPrPb, DVI-D / and SDI signal types through DVI-I1 and BNC connectivity2 respectively. The Orion HD can handle different resolutions and rates: SD (NTSC/PAL), HD (720p, 1080i and 1080p at up to 60Hz), PC (up to 1920 x 1200 @ 60Hz) and non-standard3 . The Matrox Orion HD includes a programmable color space converter for obtaining the most accurate color representation of the original image. In addition to two independent video input paths, the Matrox Orion HD features four independent video outputs (two DVI-I and two SDI). The video outputs are not only independent from each other but are also independent from the video inputs for maximum configuration flexibility. The video outputs can be used for a single extended Windows® desktop or a separate Windows® desktop and exclusive display for the application4 . The video outputs support RGB / DVI-D / and SDI signal types through DVI-I1 and BNC connectivity2 respectively. The Orion HD outputs can support various resolutions and rates: SD (NTSC/PAL), HD (720p, 1080i and 1080p at up to 60Hz) and PC (up to 1920 x 1200 @ 60Hz). Using a Matrox-designed graphics controller, the Orion HD can overlay standard Windows® graphics on the video outputs. 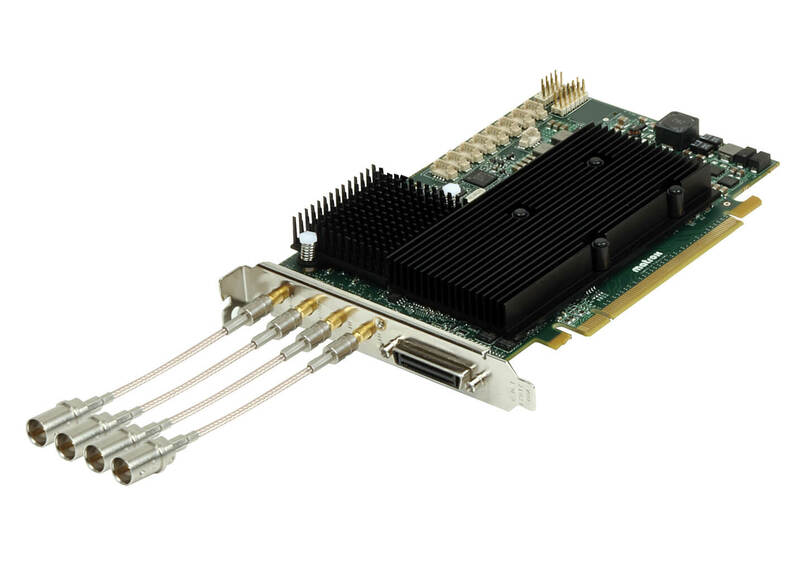 A PCIe® x16 host interface provides the Matrox Orion HD with the throughput necessary to handle the transfer of two HD video streams to host memory. With a peak bandwidth of up to 4 GB/s, the Matrox Orion HD’s host interface prevents video data from inadvertently being discarded while the point-to-point connectivity of PCIe® stops other add-in devices from consuming valuable bandwidth between the card and the host PC. Matrox Imaging not only carefully selected each component in the Matrox Orion HD to ensure product availability in excess of five years, but also exercises strict change control to provide consistent supply. Longevity of stable supply lets OEMs achieve maximum return on the original investment without incurring the additional costs associated with the repeated validation due to constantly changing products.